Have you ever noticed an email address on a business card or website like “greatlakes16@verizon.net” that just screams “unprofessional”? Chances are that the answer is yes. While the email address is not offensive, it does not convey a sense of professionalism (or branding), either. 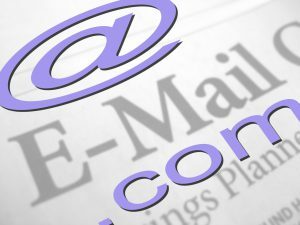 All businesses today should have email addresses using their website domain name (e.g. jane.doe@mybusinessdomain.tld). It is a relatively inexpensive bit of marketing you can do to lend your company’s online presence more credence. What about individuals that are used to checking just their personal email account, and worry that creating a new email address using their domain name will disrupt their workday flow? Most email services (Gmail, Outlook, Hotmail, Yahoo!, etc) provide email forwarding to overcome this obstacle. One can easily forward all email from their professional email address to another email address (e.g. their personal email address). This prevents the need for checking a separate email address. You must have a domain name registered: For example, if you have a website at mybusiness.tld, you most likely already have your domain name registered. If you do not have a domain name, typical TLD’s (Top Level Domains such as .com, .net and .biz) can be registered though IFTS for $19.99 per year. You must subscribe to an email service: There are several email service providers that offer a number of useful features for business users, including extensive address book tools and spam protection. Expect to pay at least $5 per user per month for an email service. IFTS can facilitate setting up an email service to utilize your domain name. Alternatively, most hosting providers offer a limited email solution free with a hosting plan that will make use of your domain name. These email services tend to not be as full-featured as the paid email options from Google, Microsoft and Yahoo!, and are less reliable due to being dependent on your hosting provider’s server availability. In other words, when their server goes down, so does your email! Which email service is right for you? IFTS exclusively recommends using G Suite by Google Cloud email service (https://gsuite.google.com). This is Google’s business email offering, and offers a very robust webmail experience, as well as included cloud storage and integration with their business productivity web applications. IFTS can easily route your email to G Suite. The cost is $5 per user per month, and you can have multiple aliases associated with each user. Previous Previous post: Google wants YOUR website to be mobile friendly right NOW…Is it? Next Next post: Is your website ready for the next Google SSL update and how will it impact your business?